Thread: Any suggestions for a leather strap for Gray Ploprof? I would like to add a leather strap for my Ploprof, but I don't know which way to go. I'm not sure how much I'll end up wearing it and gray is a difficult color to match, so the budget is around 50 Euro. The only option I found that ticks the boxes of width (24mm) and thickness (5mm) so far has been this strap from Watchgeko. Can you guys suggest anything else that's interesting. 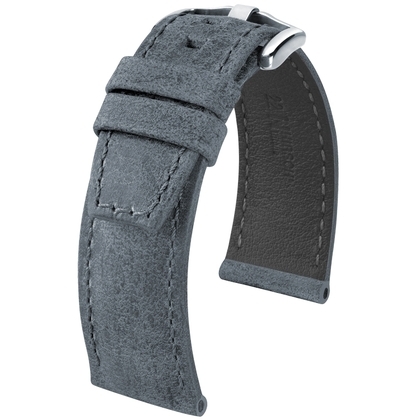 Re: Any suggestions for a leather strap for Gray Ploprof? A bit higher than your budget but I think it would look great on your watch. Here’s the other one that I think would really compliment the Ploprof. Hi Pikeman, great suggestions, thanks! I like the second one quite a bit, but I wonder if it's thick enough at 4.7 mm. I'll try to see if I can find more pictures of it. Btw, do you own either of them? I really like the second one but haven’t found a watch to put it on at this time. So I don’t own either but this was was my favourite. I know it's not what you're asking for but I think an Erika's MN strap pairs perfect with the Ploprof. I'm really busy these days so not a lot of time to do my own research, so I just ordered the strap that @pikeman suggested. Should arrive next week. Will report on the results. Hope it works for you . Looking forward to the pictures. So the strap arrived, but I'm immediately returning it. I'm not confident that it will look good on the Ploprof. The strap has a prominent cross-sectional curvature which doesn't go with the Ploprof's straight lines look. Think you are right about the strap profile. The colour looks very different to the one on the website although real skin tones can vary. Please suggest good quality leather straps for my Stowa Flieger! Any suggestion for 21mm leather strap for IWC?